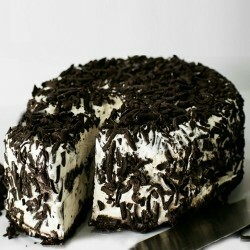 Black Forest Ice Cream Cake offers a world of goodness and delight which pleases the taste buds. Ice cream cake is especially good for those of you that are in a hot part of the world for the festive season as it is a deliciously cooling way to finish off your Christmas feast. It would also work well as an alternative dessert for children or picky teenagers. Black Forest cake made all nice and perfect for a hot summer day by adding ice cream. •	This hygienically cake is nothing less than a craving for people of all ages.